In addition to its choral program, Lakeland Christian School offers a comprehensive band program for students in fifth through twelfth grade. Fifth grade band students begin by selecting instruments, with the help of the band directors. 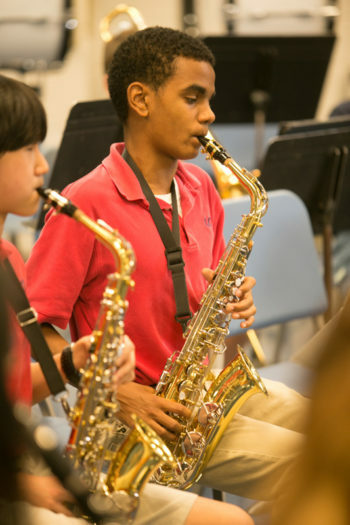 These students develop quickly and perform at concerts in October, December and May. Students may also choose to begin the band program in sixth grade. The sixth grade band is made up of first and second year band students. Beginning festival preparation is addressed with this group as they perform at the ACSI Band Festival. Our Middle School Band performs several times throughout the year including band festivals, Pep Band, All-State and All-County activities. The middle school band also combines with the high school band to march in the Lakeland Christmas Parade. The Symphonic Winds is the premier instrumental music organization at Lakeland Christian School. In addition to band festivals, pep band activities, All-State and All-County activities, this group serves as the “Pit Orchestra” for the LCS Christmas musical, performs at Disney, and attends the FBA State Festival. Mrs. Mindi Mulligan serves as the Director of High School Bands, and Mrs. Kathy Johnson serves as the Director of Middle School Bands.